Species name meaning 'the real one', meaning the true cinnamomum producer. 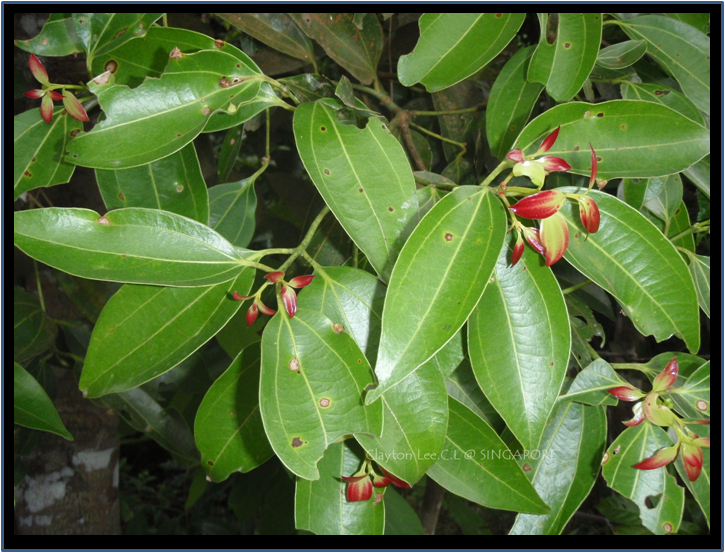 Cinnamomum carolinense var. oblongum Kaneh. Cinnamomum zeylanicum var. cassia Meisn. Cinnamomum zeylanicum var. foeniculaceum Meisn. Cinnamomum zeylanicum var. inodorum Meisn. Cinnamomum zeylanicum var. microphyllum Meisn. Small tree with strongly scented bark (cinnamom). Twigs glabrous, with only the tip hairy. Stipules absent. Petiole 0.5-2 cm long. Leaves (sub-)opposite, tri-veined, glabrous, up to 12 by 6 cm. Inflorescences branched, up to 12 cm long, hairy, with small whitish flowers. Fruits purple-black drupes up to 13 mm long, with cupule at base. The bark is used as a spice, the oil from the bark is used as a flavouring agent in food and pharmaceutical industries, as medicine and in the perfumery industry. Native to Sri Lanka, but currently cultivated across the tropics. English: Ceylon cinnamon, Sri Lanka cinnamon. Sri Lanka: Kahata kurundu, Mapat kurundu, Naga kurundu, Pani kurundu, Pani miris kurundu, Pat kurundu, Pieris kurundu, Sewala kurundu, Weli kurundu.